Sadly our trip to Brazil is over now. We spent the last part of our vacation on Ilha Grande, an island a few hours outside of Rio. We feared the trip to the island might be a bust because of a bad weather forecast, but it still turned out pretty good. We took a transfer from Rio early in the morning and arrived on the island just after lunch. It rained our whole way to the island, so we weren’t feeling up for beaches, but we decided to go on a little 3km hike that somehow turned into 8+ kilometers. 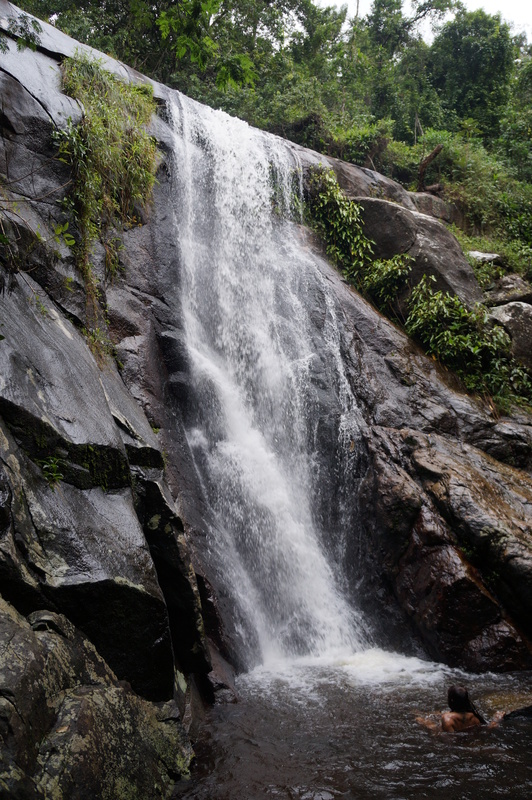 Our intention was to hike up to an old aqueduct that still transports water down to the main city of Abraao, but the rain cleared up a bit, so we decided to continue on another few kilometers to Feiticeira Waterfall. It looked pretty small compared to what we saw in Iguazu, but it was still quite nice. Our hiking boots have definitely seen better days though! The whole trail was covered in red clay, which got incredible sticky thanks to all the rain and got caked all over our boots and legs. The sun was trying to poke out the following morning, so we rose early to complete a 7km hike out to Ilha Grande’s best beach, Lopes Mendes. We seemed to be the first ones out on the trail and even though it was mostly uphill, we enjoyed the first few kilometres of the trail. 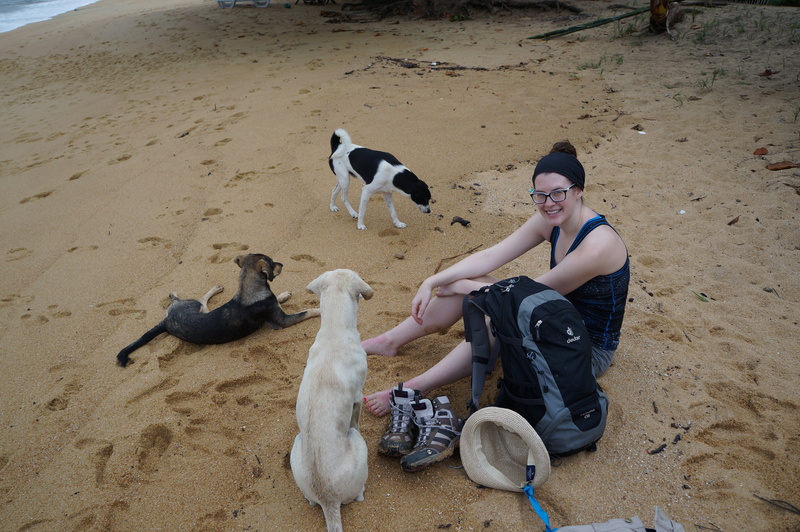 There’s a lot of dogs on the island, mostly strays unfortunately, and we picked up two doggy friends at the start of our hike. At first we tried to shake them off because I’m usually pretty weary of animals in other countries, but they were very sweet and hiked most of the way to Lopes Mendes with us! There was a little brown one that was always taking off into the woods and a bigger white dog that would run ahead after the smaller dog and then wait for us to catch up (he was sweet and I really liked him). They disappeared after about an hour and we weren’t sure what happened to them, but they eventually caught up with us later on with another group of hikers. I read before we came here that Lopes Mendes was ranked as one of the best beaches in the world and it did not disappoint! It’s definitely near the top of my list! It was just miles of the finest, cleanest sand I’ve ever seen. It was so soft and we spent a lot of time just hanging out in the shallows. At first when we saw the waves at Lopes Mendes we were a little disappointed because they looked really large and we had gotten pummeled by the large waves at Copacabana, but they ended up being perfect. The slope of the beach is very small, so the waves would break really far out and were great for jumping around in. Everyone in Rio told us the water would be too cold for swimming because it was almost winter, but unsurprisingly, we didn’t find it cold at all and thought it was the perfect temperature! 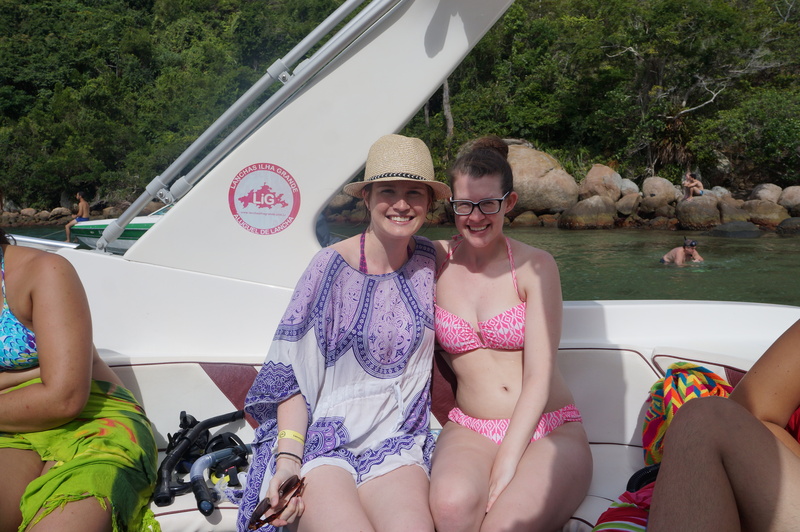 On our second day in Ilha Grande we decided to explore the island by boat. Tourism definitely plays a large role for most of the locals living on the island and there were dozens of little agencies offering a number of excursions around the island. We decided to do a snorkeling tour of the north half of the island. We spent the day on a nice high speed motor boat with a dozen other tourists and visited several different beaches. 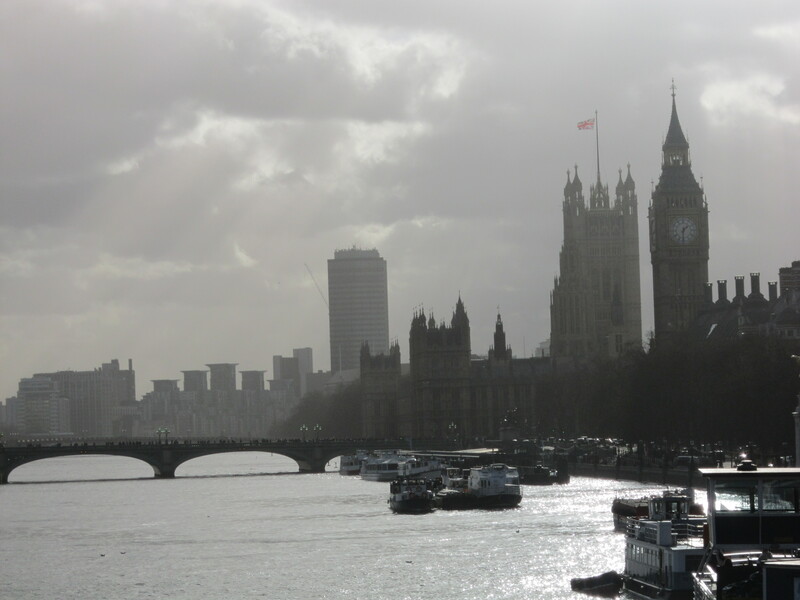 The sun was out when we left and fortunately it stuck around for most of the day. Our first two stops on the boat were the snorkeling locations, Lagoa Azul and Lagoa Verde, which translates to blue and green lake. Lagoa Azul had better reefs, with lots of bright fish and some coral, but I ended up having more fun at Lagoa Verde. Our boat driver had some fish food that he threw in the water while I was snorkeling near the boat and I got a great view of all the fish as they swarmed around. He gave me some to feed them as well – they’re these little pellets that you hold in the water and all the fish bite at them. I was surprised at how aggressive they were and they quickly devoured all the food! A few of them gave me little bites on the arm and I realized there was another kind of fish swarming around my feet when they bit me on the legs too! It was all fun though, everyone else seemed a bit reluctant to be in the middle of all the fish, but I enjoyed it. In the afternoon we stopped to a different beach for lunch and then toured another few beaches on the way back to Abraao. The tide had come in by then, so unfortunately the beaches had shrunk quite significantly, but it was still nice to get a tour of the island. Emily and I both agreed though that Lopes Mendes was the best beach and that overall, the boat tour and snorkeling we’re probably a little overrated. We were glad to support the livelihoods of those living on the island, but our preference probably would have been to do some more beach hopping by hiking rather than boat. But it’s a very beautiful island! On our last night in Rio we decided to go all out and go on a pub crawl with the group that organized our walking tour when we arrived. 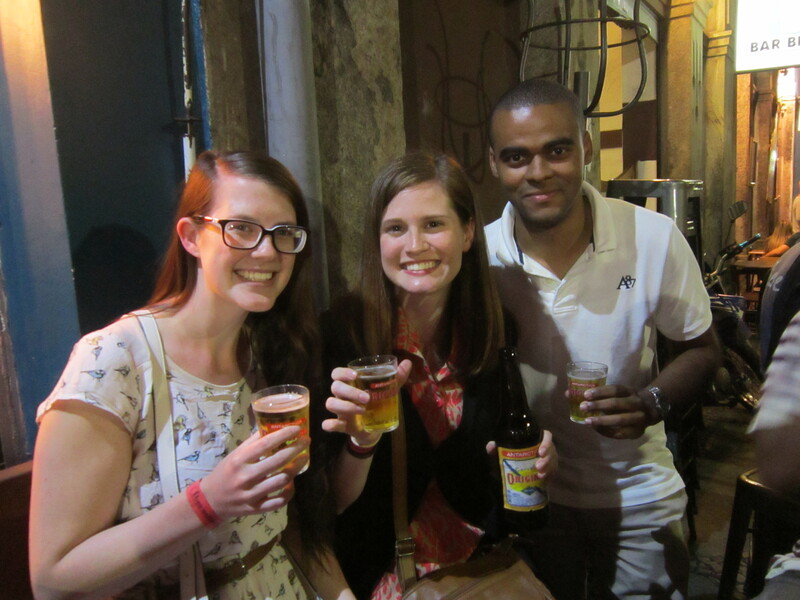 The pub crawl goes all around Lapa, which has the best night life in Rio and we had a blast! Emily has a friend from Rio, so he joined us for the evening and we all had a great time sampling some of Rio’s best bars and clubs. We started at a Cachacaria. Cachaca is the key ingredient in Brazil’s favourite cocktail, the caipirinha, so we visited a small bar called Cana Kriok that makes its own cachaca and got a lesson in how to make the perfect caipirinha. The other ingredients include just lime, sugar, and ice; I picked up a bottle of cachaca to take home, so I’ll have to try them out myself! The caipirinhas at Cana Kriok were easily the best ones I had the whole trip. Apparently they’re best made individually and the large batches of caipirinhas they sell on the beach just can’t compare. Our second stop was to a “typical Brazilian bar”, Antonio’s, which Emily and I had unknowingly visited earlier in the trip. The last two clubs we visited we’re where we finally sampled some samba! The first club was Sacrilegio, which is a very old club that is known as the birthplace of samba. There was a live band and we had a great time attempting to learn some samba moves! We were so bad at it, you have to move your feet so quickly, but we had fun nonetheless. The last stop was Rio Scenarium, the most famous club in Brazil and ranked one of the top 10 clubs in the world by The Guardian. It had three floors and was enormous! The main floor had more Brazilian music and samba and the second floor had electronica. Brazil just hosted it’s first Tomorrowland festival in São Paulo last week, so the second floor was packed. We spent some time on both floors and were more then happy to spend the remainder of our night at the Scenarium! Our flights didn’t leave until after 9pm on our last day, so we took it easy and spent the day walking along the beaches again. We did a little hike up to a small fort located near the beach to finish off the trip with one last view of Rio. It was definitely a rewarding view and hike. 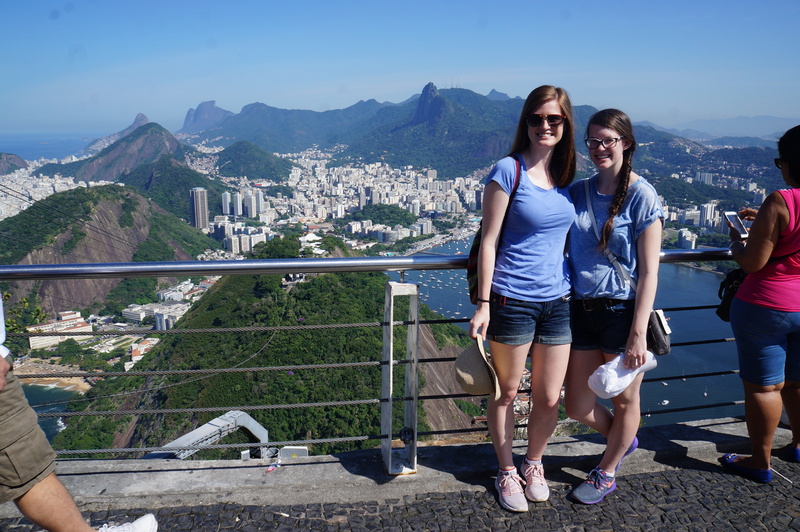 We met lots of little marmosets on the way up and we had a great view of all Rio’s famous attractions, the Sugarloaf, Christo Redentor, and Copacobana Beach. It was a pretty satisfying way to end the trip. As with most trips, I’m sad to leave but happy to be home. I don’t have too much of a break though as my parents are coming for a visit in just 3 short days!! 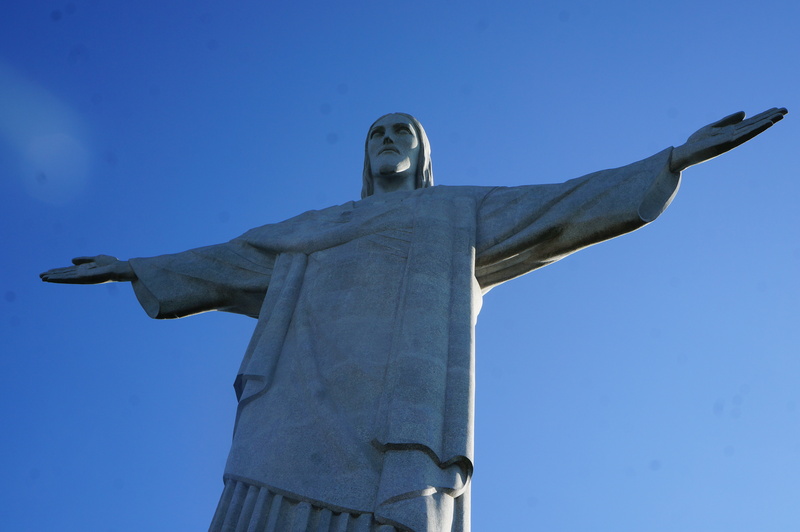 I hope you enjoyed the blogs about Brazil, I really enjoyed writing them. Check my Facebook for pictures soon! Otherwise, I’m sure I’ll have lots of fun summer adventures to share with you soon! 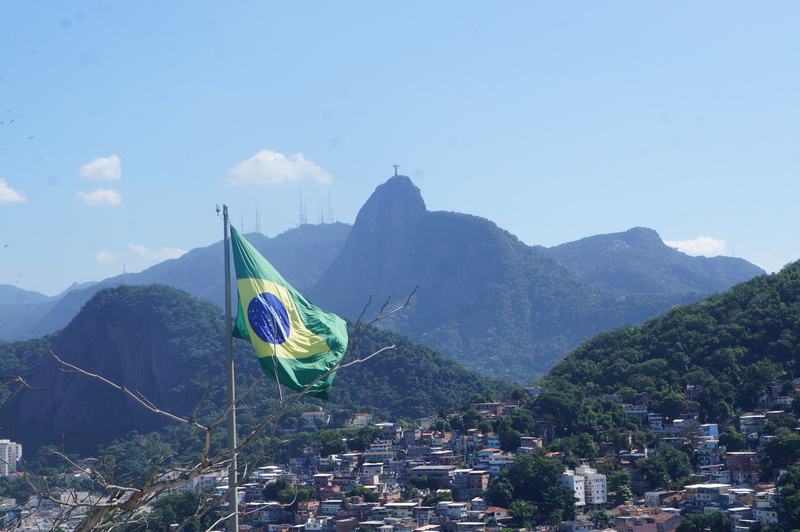 On our second visit to Rio we stayed in Zona Sul, home to Copacabana and Ipanema beach. We immediately preferred it to Lapa. Our hostel was located just 4 blocks from Copacabana beach and the atmosphere was immensely different. Copacabana stretches for 5 kilometers in an arc across south Rio until it reaches the Copacabana fort and Arpoador, where it continues into Ipanema and Leblon beach for another several kilometers. The weather cooperated great and we headed straight for the beach upon our arrival. 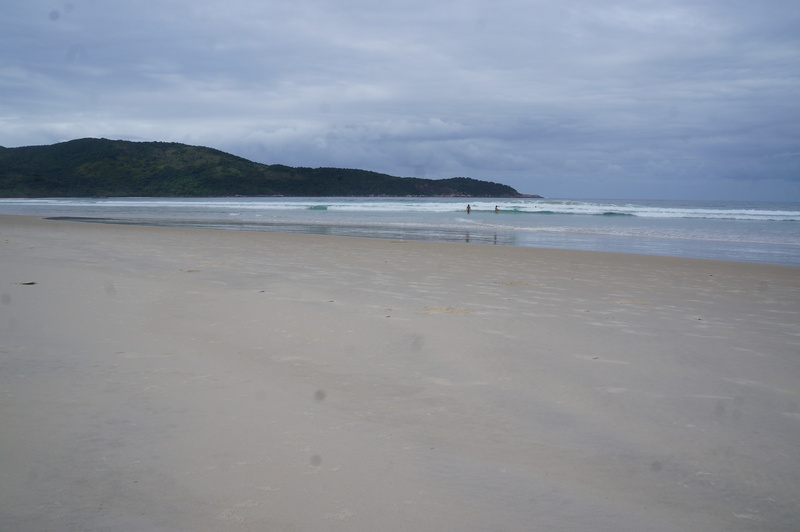 We arrived on a Saturday, so the beach was packed with locals and tourists alike. We found a nice place to lay our towels and settled in for the afternoon. The waves along the beach are enormous, but it’s so hot and humid it doesn’t stop anyone from cooling off in the water. We had to be so vigilant with sunscreen while at the beach, but managed to avoid getting burnt (except for the tops of our feet). You can’t spend very long at the beach without noticing how many people make their livelihoods from it. There are locals roaming the beach all day selling every kind of product imaginable. The first people you notice are those renting beach chairs. It seems each person manages a different area of the beach and as soon as you enter their section, they try and get you to rent a chair or umbrella from them. Then there are the people selling beach goods, from towels and cover-ups, to sunscreen, bikinis, sunglasses, hats, beach buckets, and even inflatable children’s pools. Finally, there’s the people selling food and drinks. They’re my favourite, you could easily spend the whole day on the beach without having to go in search of food. There are guys selling sandwiches, mozzarella sticks, prawn skewers, chips, ice cream, and our favourite, acai! The second day we went to the beach Emily flagged the acai guy down from halfway up the beach! The last are those selling drinks. I still find it very strange that drinking alcohol in public is legal in Brazil, so there are tons of guys roaming the beach all day with coolers of beer and trays of caipirinhas. 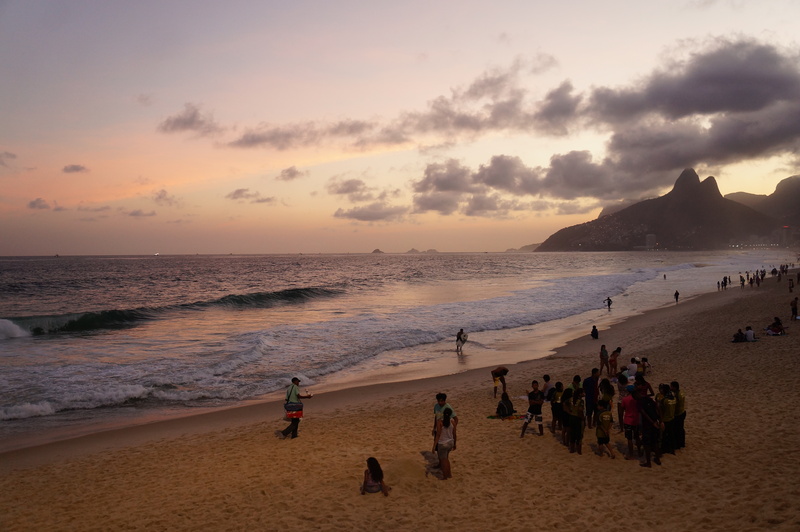 On our first day, we decided to walk up Copacabana Beach to the Arpoador in Ipanema to watch the sunset. The Arpoador is a huge rock that juts out into the ocean between Copacabana and Ipanema. It has a great view of the sunset over the mountains and was packed with people on every inch of the rock on Saturday evening! We found a spot and enjoyed watching surfers ride the waves as the sun dipped behind Ipanema. It was calling for a cloudless day on Sunday, so we decided to attempt to see Sugarloaf and Christo Redentor in one day. We visited Sugarloaf first; it was pretty early so we had a quick ride to the top without any wait. The cable car first takes you up to Morro da Urca, the smaller of the two mountains, and then a second cable car takes you to the top of the iconic Sugarloaf mountain. 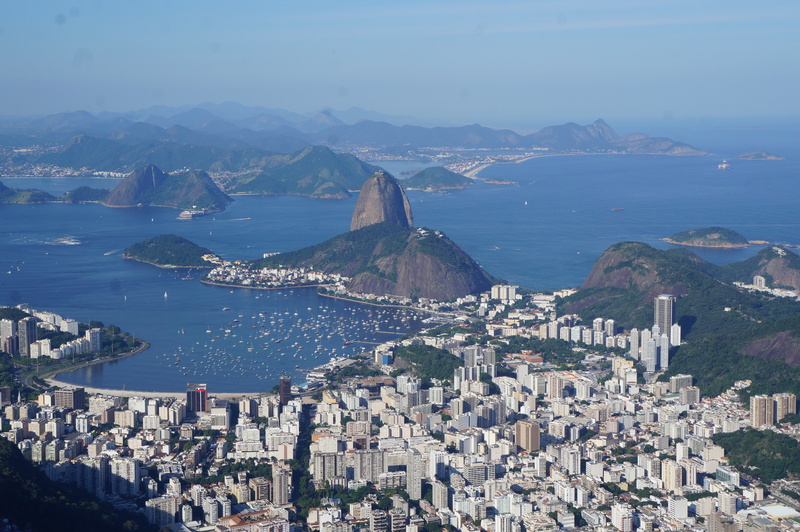 The view from the top gives you an amazing 360 degree view of Rio. We could see straight out to the Christ the Redeemer statue, with the beaches on one side and Lapa and Centro on the other. After we snapped a few photos, we discovered a little path going down the back of the mountain that it seems most tourists ignore. You couldn’t see the view there, but you could enjoy the jungle on the back of the mountain instead. We saw some interesting bugs hanging around and watched a group of marmosets jumping from tree to tree. We messed up the bus stop location after we left Sugarloaf and spent a fair bit of time wondering around, somehow ending up at Botafogo Bay, but we found it eventually and hopped on a bus to Corcovado. We were impressed with our quick ascent up the Sugarloaf, but we paid for it at Corcovado. The later in the day you wait, the longer the lines get. In order to go up to the Christ the Redeemer statue, you have to take an old tram through Tijuca National Park, up the side of the Corcovado, so only so many people can go up at once. Fortunately we didn’t have to wait too long to get tickets, but our tram ticket was for about an hour and a half after when we purchased it. Things could have been a lot worse though and we just used the extra time to go in search of lunch. It was a nice ride up to the statue, but I have to admit the tram was a bit dated. It’s a narrow ride up to the top, so there’s only one track and you have to stop 3 or 4 times on the way up at wider sections to wait for the tram coming down to pass. It took about 30 minutes, but we were dying at the end from the heat in the un-air conditioned carriage. The view from the top was worth it though! If we had to pick, we both agree that the view from the Corcovado was better than the view from the Sugarloaf. However, the crowd was not. It’s a very narrow platform at the top with a lot of people crammed in taking pictures of both the statue and the view. It made me almost thankful for the bottleneck at the bottom, which at least slowed down the flow of people. We stayed for a little while to take our pictures and admire the view, but it was a bit too crowded for us. You can’t help but admire the statue though! Up until now, our schedule has been pretty packed with activities, so on Monday we finally had a nice relaxing day at the beach. 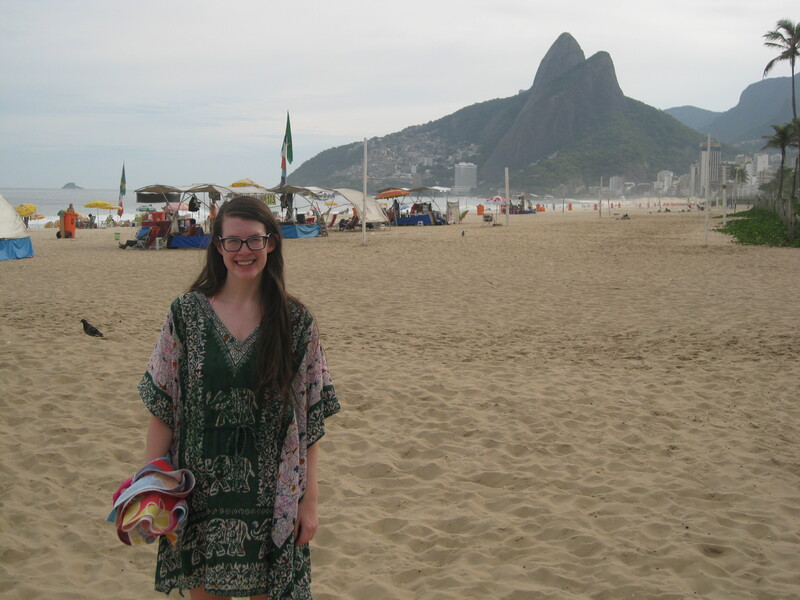 We slept in and then made our way down to Copacabana Beach. Our strategy was to spend an hour or so in one spot and then pack up and move a little further down the beach, eventually making our way to the end of Ipanema Beach. It was extremely hot, so we spent a fair bit of time cooling down in the waves. It was definitely a nice relaxing day and was less crowded since it was a week day. We finished off with some shopping in Ipanema and took a break from Brazilian food and shared a huge plate of nachos on the beach for supper. We’re in Ilha Grande now for the last leg of our vacation. It looks like our good luck with weather has finally run out and it’s calling for rain the next few days. But we’re going to try and make the best of it and hopefully we’ll still get to enjoy Ilha Grande’s premier beaches! 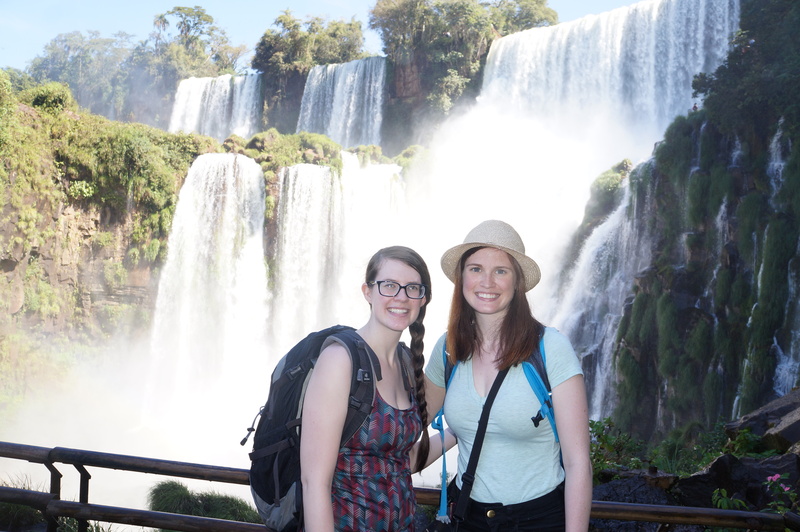 We’re back in busy Rio, but we just had the most amazing 3 days in Iguazu Falls! We flew through São Paulo to get to Foz do Iguacu; we’re not spending any time in São Paulo, but we got a quick glimpse of it from the plane on the way to and from Rio. I thought Rio de Janeiro was a big city, but São Paulo was enormous! There were miles of skyscrapers as far as we could see! Rio has about 10 million people in the city and surrounding area, but São Paulo has 20 million. I’m sure it’s a cool city, but it was kind of a relief not to have to have to navigate such a large city. 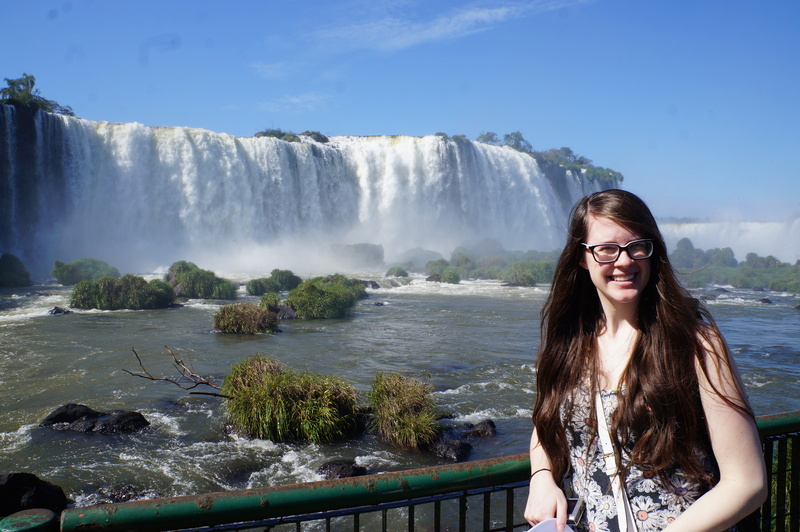 We arrived in Foz do Iguacu in the early afternoon and decided to drop by the tri-border. Rio Iguazu, the river Iguazu Falls is located on, marks the border between Brazil and Argentina. A few kilometers from the falls, the river intersects with Rio Parana, which marks the border between Paraguay and Brazil. The tri-border is where the rivers meet and you can see Argentina on one side of the river and Paraguay on the other! There’s a monument on each side painted like the respective country’s flag. We had fun snapping a few pictures of all three countries. 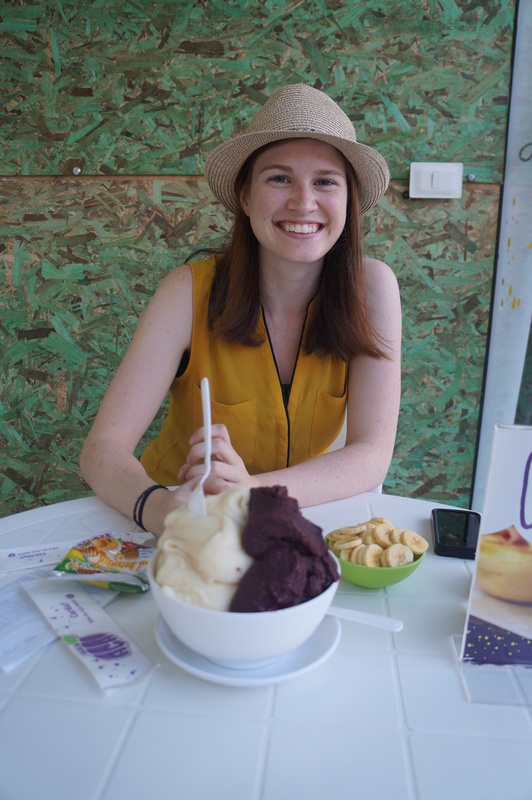 In Foz do Iguacu, we finally got the opportunity to try acai, which we’ve been hearing a lot about from other travelers we’ve met. Acai is a berry that is very popular in Brazil; they serve it frozen and whipped like sorbet. We tried it with cupuaco, a sour tasting fruit, with bananas and granola on top. We ordered a large bowl to share and had a great laugh when we were served a gigantic bowl with acai piled up to about twice the height of the bowl! It was delicious though and we actually finished almost all of it. Since the falls are located on the border between Brazil and Argentina (and since we’ve flown so far to see them), we decided to spend a day on both sides of the falls. In case you’ve never heard of Iguazu Falls, it’s a series of waterfalls that flow from the enormous Iguazu River. There’s more than 200 different waterfalls stretching along the river, approximately 70% in Argentina and 30% in Brazil. We honestly couldn’t pick which side we liked better as both sides were very different. We spent our first morning on the Brazil side. There’s only 1.5 kilometers of trails on the Brazil side, but since most of the falls are on the opposite side of the river, you get a great panoramic view of them as you walk along the trail. You start at the downstream end of the falls, so as you progress upstream, the waterfalls just keep getting more and more impressive! You finish just downstream of Devil’s Throat, the biggest waterfall, which extends in a huge horseshoe around the river and has the largest flow of water. The viewpoint on the Brazil side has walkways that jut out over the bottom of the river and look up at the huge wall of water that is Devil’s Throat. It is an incredible view and the volume of water pouring over the falls every second is mind-boggling! Since the waterfalls are located in a preserved area, Iguazu National Park, there were lots of animals and birds to see around as well. It’s easier to see wildlife on the Argentina side, but we still saw lots on the Brazil side. The most common mammal is the quati (or coati). I can only describe it as a South American raccoon. They have really long noses and striped tails and at first you think they’re really cute, but then you quickly realize what a pest and a nuisance they can be. I put my bag down at one viewpoint and when I looked back, the quati’s had swarmed it! Then at lunch, we saw one jump up on the table and grab an entire box of french fries from a surprised couple. There were lots of swallows and vultures flying around the falls, but the most numerous thing we saw was butterflies. There were butterflies of every size, shape, and colour flying all over the park! Since we only needed a morning to see the Brazil side, we spent the afternoon at a bird park called Parque Das Aves. It was enormous and we saw every type of South American bird imaginable, including toucans, which I’ve always wanted to see up close. They have a few aviaries set up in the park where the birds all fly around together and you can walk through. In one of them there was a little red-breasted toucan just hanging around on one of the rails and he let us pet his head! We were surprised because it wasn’t something set up by the park, it was just a stroke of luck. We wondered if we might get tired of the falls on the second day, but it was impossible as they are so incredible and both sides of the river offer very different perspectives. To make logistics easier, we went with a tour group to see the Argentina side. We all crossed the border together and spent the day exploring the falls as a group, except when Emily and I did a boat tour. The boat ride was called the Gran Aventura, or the Great Adventure, and was one of the first things we did. It starts with a 20 minute ride through the jungle, before loading into boats that will take you up the river to the falls (they called them boats, but they were really just gigantic rafts with a motor). I was slightly terrified on the ride up the river as we went over some really large rapids. We had a great view of the falls from the boat though and the captain finished by essentially driving us under a few of the waterfalls. We got absolutely soaked… well Emily did. I had a poncho, so I didn’t get too wet, but with only a rain jacket, Emily got really wet. Still a fun experience though! Since there are so many more falls on the Argentina side, there are a lot more trails. There was no time to rest if we wanted to fit everything in, so as soon as we got off the Gran Aventura, our group whisked us away on another boat to cross to San Marten Island to do the trail over there. We did a little hike around the island; there’s a lot of viewpoints and they’re all amazing. We were a little preoccupied though because we were both dying to pee after our first boat trip and we had a laugh at each other trying to find somewhere to go in the woods that wasn’t surrounded by tourists! We spent the afternoon doing the rest of the trails, including the upper and lower circuits above and below the falls. As promised, the wildlife was much more impressive on the Argentina side. 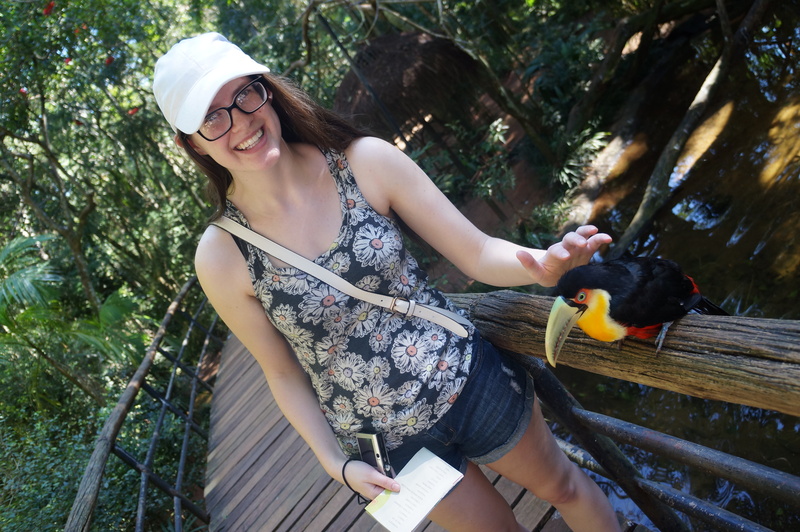 We saw tons of birds, including a real, live, wild toucan! It was a toco toucan and we had a great view looking down on him perched in one of the trees. 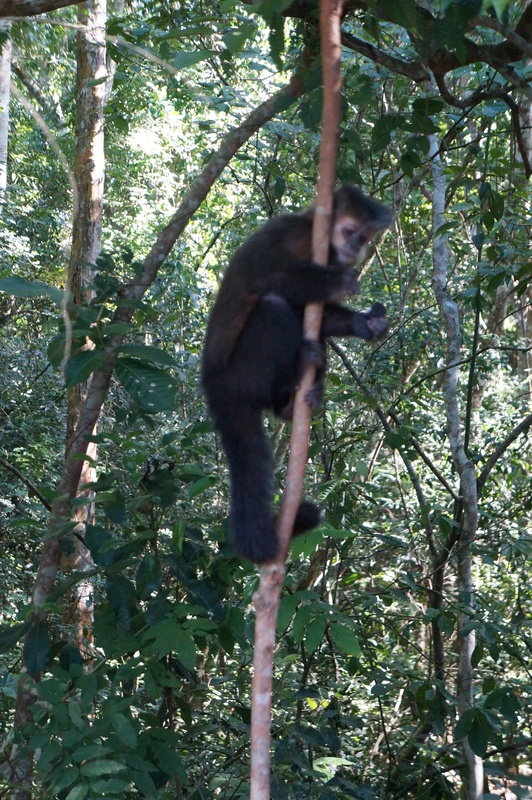 We also saw a family of brown capuchin monkeys! They were hanging around in the trees near one of the paths, but we were really sad to see people feeding them bread. There are signs all around the park explaining not to feed the wildlife because our food is not natural to their diets and being fed all the time can cause them to become aggressive or develop diabetes. We experienced this first hand we one of the women in our group got attacked by a quati. It tried to steal her bag and then gave her a huge scratch down the back of her leg. We just hope she goes and gets the appropriate shots! We finished the day with a visit to Garganta do Diablo (Devils Throat). 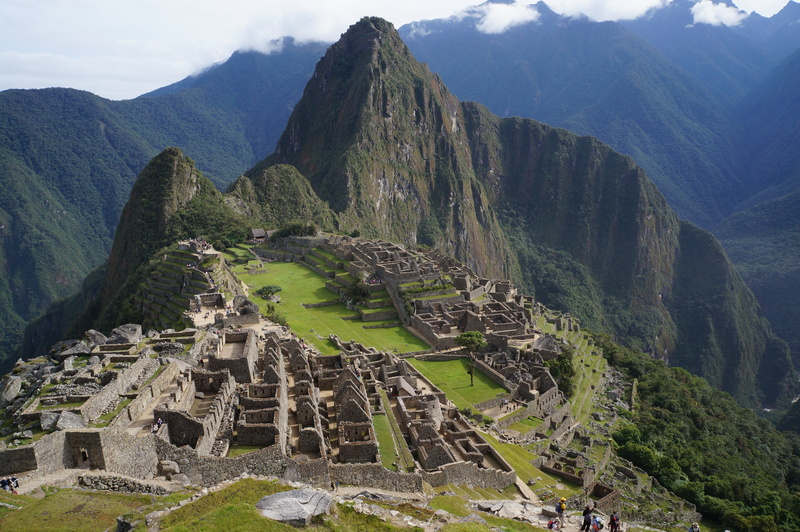 Since it’s located on the Argentina side, this time we approached it from the top. We got a better idea of the huge scope of the river when we had to walk a full kilometer on walkways across the river to get to Devils Throat. It was unbelievable! The river flows over the edge in a huge horseshoe, with water pouring over all sides. The viewpoint is located on one side of the horseshoe, so you can see the water thundering over the edge below your feet and all around you! We got wet again from all the mist, but we stood watching the river pounding over the edge for quite a while before walking the trail back across the river. Iguazu Falls has been on my bucket list for a while and it absolutely lived up to the hype. I wasn’t sure if it would live up to my expectations after having already seen so many pictures of the falls, but it definitely surpassed them!